(Daily Mail) Americans like to donate their money and time to charity, with the U.S. ranking fourth most-generous nation in the world - but not all states give equally. Minnesota is ranked the most charitable state in the nation, while Nevada came in dead last in a new analysis by WalletHub, a personal finance site. Experts analyzed and scored how each state performed in two areas: volunteering and charitable giving. They broke down those categories along 18 different metrics to analyze each state based on factors, such as: the number of volunteer hours per capita; the share of income donated; the share of the population donating money; and food banks per capita. Minnesota performed well largely due to coming in first in the category of volunteering, as well as ranking fourth on charitable giving. Utah was the second most-generous state in the nation, coming in fourth on volunteering and fifth on charitable giving. 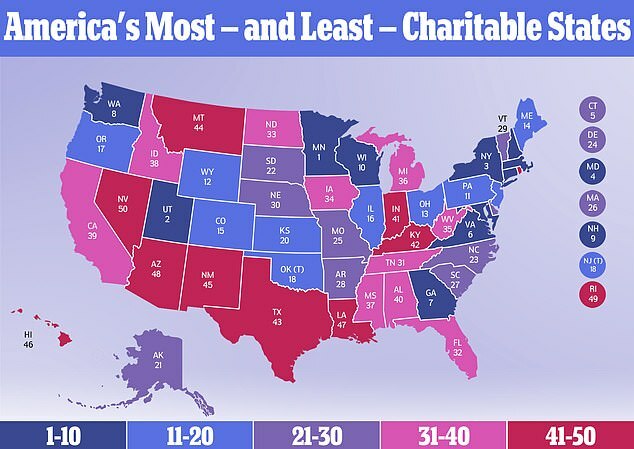 New York followed, ranking first for charitable giving, but in 21st for volunteering. Maryland ranked fourth, followed by Connecticut, Virginia and Georgia. Washington State came in eighth place, while New Hampshire was ninth and Wisconsin was 10th place. Politics was a key unifying trend among the most generous states, Gonzalez told DailyMail.com. At the less generous end of the spectrum, Nevada ranked 46th in volunteering and 49th on giving, making it (overall) the least charitable state in America. Rhode Island was the second-least generous state in the nation, thanks to coming in 50th on volunteering and 33rd on charitable giving. Arizona was next, ranking 37th on volunteering and 50th on donations, followed by Louisiana, Hawaii and New Mexico. Montana was the seventh least-generous state, followed by Texas, Kentucky and Indiana. When it came to volunteering, Utah had the highest rate of volunteers in the nation, while Florida had the lowest. Utah also had the highest percent of the population who donated their time to a good cause – while Kentucky had the lowest percentage. Utah also tied with Georgia for having residents with the highest percentage of donated income, while West Virginia came in last for that category. Overall, donors in the U.S. gave away more than $410 billion in 2017, with the majority (70 percent) of donated funds coming from individuals, according to the National Philanthropic Trust. In addition, nearly 63 million people volunteer each year in the U.S. for an annual total of 7.9 billion hours – the equivalent of $184 billion man hours. A 2012 survey by GuideStar found that 50.5 percent of U.S. nonprofits said they received the majority of their contributions from October-December.